Golden’s Traditional Series is all about traditional styles to match many decors. The popular Cambridge lift chair has been re-designed and re-sized to fit more people better than before! The improved Cambridge models feature a softer, yet more supportive biscuit backrest design and now feature Golden’s hybrid sizing! The PR401-SME is the small/medium for people 5’1” to 5’6” and the PR401-MLA is the medium/large for people 5’7” to 6’4”. The Oxford is the first club-style chair that lifts! Available in the plush padded suede in Silt and Mahogany, the Oxford is the ideal second lift chair in your home, or the perfect lift chair for adult children to have in their homes for when mom or dad come to visit. 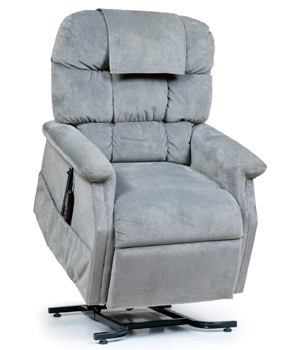 The Williamsburg is a traditional, colonial-style lift chair with a button backrest design and wings for the perfect finishing touch. Golden Technologies takes all the worry out of purchasing a lift chair. Their expert craftsmen blend the finest components with superior designs to provide you with the utmost quality, comfort and style. Golden confidently stands behind all their products and provides you with the best warranties in the industry. Choose the lift chair that all others are measured against… choose Golden!